Since launching our blog earlier this year, we’ve shared a number of customer case studies with you. I hope that in doing so, you’re getting a feel for the value that business intelligence solutions can bring to the enterprise. When a company makes a commitment to business intelligence, the possibilities are endless in terms of what that higher level of visibility into the enterprise can bring. So here’s one more. We started working with Auto Club South (ACS)—which services AAA members in Florida, Georgia, Tennessee and Puerto Rico—back in 2006. ACS was looking for performance metrics that would enable them to monitor their customer interaction process, including the number of calls coming into their various branches, along with hold and handle times and other agent metrics. After five years of experience, today ACS is using HardMetrics on several fronts. They’re tracking the sales performance of individual agents, opening up opportunities for cross-selling. They’re identifying standards and best practices, and applying them across the board. They deployed an Executive Dashboard for company leadership to have easy access to the data most important to them. What started out as a project to get better insight into basic front-line metrics has turned into an enterprise-wide, sophisticated and completely automated performance management solution. And they’ve seen sales revenues increase. When ACS first started using HardMetrics, one of the goals was to reduce handle time—to increase efficiency, get agents handling more calls—you know the drill. But management had an important “aha!” moment. They could see that in the vacation business, where agents are responsible for selling cruises, tours and other prepackaged trips to customers, sales increased when handle times were LONGER. Why? Because it’s a major decision for the customer. They need a lot of handholding and explanation before they are ready to plunk down a couple grand or more for a major purchase. So, armed with this information, management let agents in the vacation business know: “Don’t obsess over minimizing your handle time. Spend time with your customers. Take all the time you need. Make the sale; don’t worry about getting off the phone and onto the next customer.” And viola! Sales increased. Smart organizations like Auto Club South are breaking new ground for business intelligence. They see the value of data. They see what it can do for performance. They know that data is the most important asset of the enterprise when it comes to continuous improvement, driving better financial results, enhancing customer satisfaction, and making course corrections to reverse negative trends or seize upon positive ones. And when they see positive results, they become the best evangelists for the adoption of business intelligence solutions. 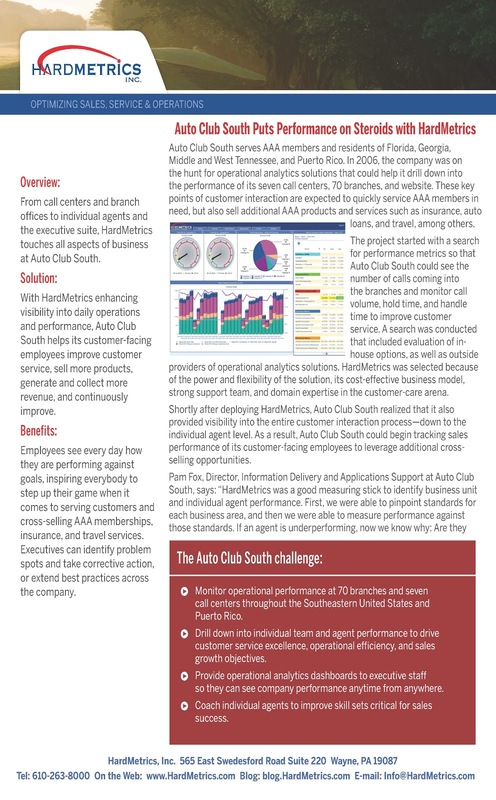 For more on Auto Club South, read the case study below or download the PDF. Auto Club South serves AAA members and residents of Florida, Georgia, Middle and West Tennessee, and Puerto Rico. In 2006, the company was on the hunt for operational analytics solutions that could help it drill down into the performance of its 7 call centers, 70 branches and website. These key points of customer interaction are expected to quickly service AAA members in need, but also sell additional AAA products and services such as insurance, auto loans, and travel, among others. The project started with a search for performance metrics so that Auto Club South could see the number of calls coming into the branches and monitor call volume, hold time and handle time to improve customer service. A search was conducted that included evaluation of in-house options, as well as outside providers of operational analytics solutions. HardMetrics was selected because of the power and flexibility of the solution, its cost-effective business model, strong support team and domain expertise in the customer care arena. Shortly after deploying HardMetrics, Auto Club South realized that it also provided visibility into the entire customer interaction process—down to the individual agent level. As a result, ACS could begin tracking sales performance of its customer-facing employees to leverage additional cross-selling opportunities. The HardMetrics solution has allowed Auto Club South to take a “rounded scorecard approach,” in which data from fifteen unique sources is integrated, correlated and made available in the form of cross-system metrics. The solution monitors and scores agent performance over eight critical KPIs, provides weighted rankings, automatically tracks whether all goals were met and calculates monthly agent bonuses. “Our representatives want to know what it takes to do a good job, and we want to reward them for that. HardMetrics is the vehicle that allows this to happen. This saves our management team’s time and allows them to focus their efforts on coaching the outliers. Everyone wins,” says Ms. Fox. Other areas in which HardMetrics is being used to provide visibility include: lead campaign management, internet sales and marketing, interactive voice response (IVR) performance, and gauging the effectiveness of direct mail.